Cline Rents offers a number of excavators with different buckets and attachments to meet your needs for excavating in Totem Lake. We try to stock the most useful mix for a variety of jobs needed by people wanting to do an excavator rental. Totem Lake commercial operations and individuals alike will find we can often meet their needs. Make sure you have read the manual and completely familiarized yourself with its operation. 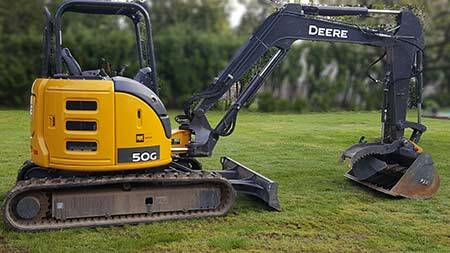 Take some time to play with the controls and test drive your Totem Lake excavator rental. You want your operational efficiency high enough that controls are understood and natural to use. Make sure your boom and blade are raised before you attempt to move the excavator. Probably the most common use of an excavator is trenching. There are a number of helpful tips to make trenching go smoothly and help you obtain the result you were looking for. The biggest tip I think is to plan it out thoroughly before you start and take your time once you start. Make sure you set up the site properly with everything marked and measured. This is critical. You need proper markers and guides to track your trenching to so that you know you have made a straight line. The line should form an offset to the excavator so you can guide the machine along it. Don't dig beneath the excavator. Doing this can cause the trench to collapse and the excavator to drop into the trench damaging the equipment, possibly the operator and creating a difficult clean up situation. Pay attention to safety. If you have a protruding back end on the cab remember that when you swing it is going to fly out and possibly catch people or materials. Remember that the forward and backward lever in the cab is relative to the tracks on the equipment, not the way the operator is facing! Be sure to store the excavator on level ground with the cab locked. Finally, one very common mistake new equipment operators make is to create a trench as a series of holes. The right way to cut a trench is like peeling an onion. Cut layers the full length of the trench until the desired depth is reached. Many times in combination with excavation equipment we see people with the need for a dump trailer. It is great for loading and hauling debris and vegetation for smaller jobs. We do a good amount of dump trailer rentals in Bothell, as you might expect. Check them out here.